I have a feeling the times on the schedule will change quite often. The weather is going to impact the tourney in a negative way. Delays, delays, delays. All our pitchers better be ready. FAU (36-15-1, 19-8-1 C-USA) finished percentage points behind Louisiana Tech when their season finale versus WKU last Saturday was rained out, after winning the first two over the Hilltoppers. Similarly, earlier this year against FIU (26-26, 15-13 C-USA), the Owls and Panthers were only able to play twice before a Sunday rainout, with the two teams splitting the Friday and Saturday games. The Panthers, ironically also, played just two games in their final series, splitting with Rice before a final game cancelation. They finished a half-game behind UTSA in the battle for the fifth seed, but comfortably ahead of No. 7 Rice. 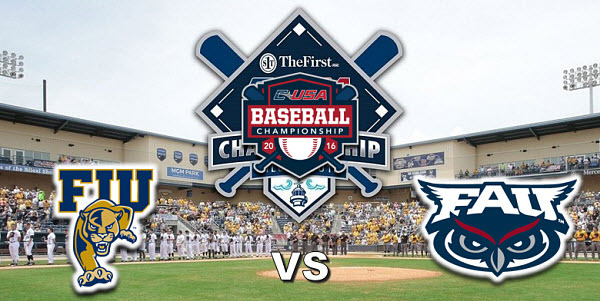 FIU has won five of their last six, while FAU has won their last four, and also five of six. In this, the tournament's first matchup, FAU will throw senior lefthanded pitcher Jake Miednik (7-1, 3.06 ERA). He did not appear in the series this year against FIU. The Panther counter with righthander Andres Nunez (6-2, 3.53 ERA). He started the opener in Miami, leaving when the game was tied 3-3, a game FAU would go on to win 11-4. In 5 1/3 innings, he gave up six hits, three runs (two earned), with a walk and four strikeouts. FAU beats FIU 7-4 in first game of tourney. For those that don't know, FIU is a great hitting team. Our pitchers spread out their hits and only gave up 4 runs. Great job. Winners bracket is where you want to be . Good win and great game winner by Miranda. I hope that his injury was just a cramp. Due to inclement weather in the Biloxi area, the schedule of games for the C-USA Baseball Championship has been altered. It seems every year the results of the tournament are affected by weather. Wasted pitchers due to rain delays are the biggest issue. The key is winning. Stay in the winners bracket and the harsh schedule is not as bad. As of this morning , the depression in the gulf has a 70% chance of developing and is moving right over that area. We don't play until Friday at 10 a.m. now vs. winner of game 2. Rice (7 seed) leads La. Tech (2 seed) 6-1 after 6 innings! Game resumes at 1:30. Go RICE! In addition, game 3 - UAB (8 seed) vs. S. Miss. (1 seed) now today at 2:30. REALK pressure on now to win THAT game as loser plays again tonight at 9:30 in an elimination game! GO UAB! GREAT news for our pitching staff as will get full day of extra rest, just as if we were the one seed!